Last week, a good friend of mine forwarded a link to Barton Seaver’s new cookbook, For Cod and Country, and even at 8am I started craving his Avocado Dill Soup. 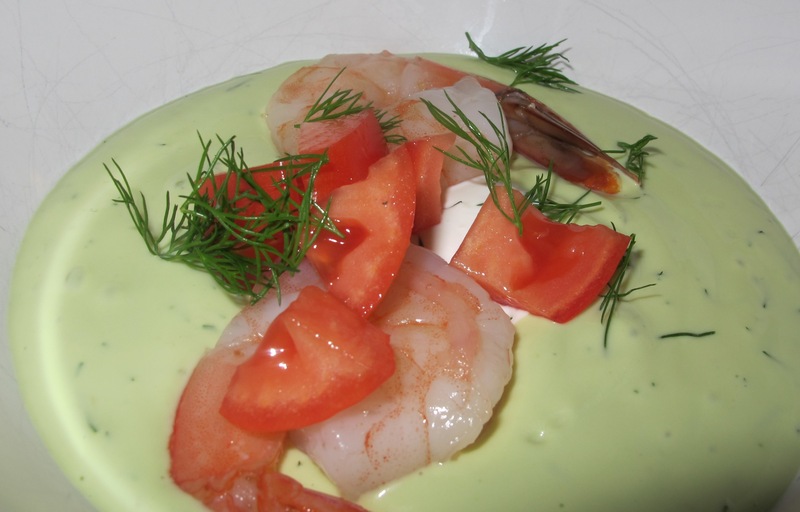 He recommends pairing it with smoked trout, but I chose cooked shrimp instead, topping it with some sour cream whisked with lemon juice. Because I like a little more structure to my soup, I added diced tomatoes as well- cucumbers or cubed (cooked) potatoes would work too. The soup is very mild if you make it to the recipe – I added extra lime juice and a touch of white wine vinegar, but it all depends on what you like. Depending on how big your avocados are, you’ll have to adjust the amount of cream to get the right consistency (bigger avocados = more cream). This is meant to be a cold soup, so make sure you chill long enough. Room temperature is not the way to go with cold cream soups. Voila!